Orange has announced two new and exclusive Orange Homescreen developments, Orange Gestures and Orange Live Wallpapers, for Android smartphones (excluding HTC Android smartphones, which will offer Orange Smart Wallpapers only). Orange Gestures provides 27 designs which users can assign to an action or application, such as speed dialling, sending a text to a specific contact or launching a weather widget or a game. There is no need to scroll, search or click through multiple steps in order to launch an application or more importantly, an action within an application. For example, if Rachel texts her best friend Alison frequently, once a gesture is assigned to this action Rachel can draw a square, which launches a text to Alison; alternatively, drawing a heart will automatically enable Bob to phone his wife, without having to access his phone screen or address book. For the first time, Orange Live Wallpapers have taken the concept of 'live' wallpapers one step further by integrating the actual functionality of a specific application into the dynamic aesthetic of the wallpaper design itself, making them much smarter than standard designs. 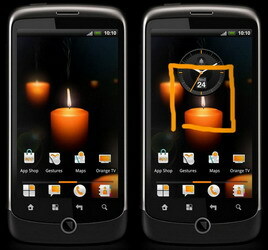 The first of these 'smart' wallpapers to launch in Q2 2011 is Orange Candles, a photorealistic candle that burns down in six stages, giving a true indication of battery life. The design is also reactive; the flame flickers as a user scrolls from left to right. Five more designs will be rolled out across Orange Android Signature smartphones in 2011, allowing customers to choose a homescreen experience that matches their style and needs. Orange Gestures and Live Wallpapers will be available on all new Orange Android Signature smartphones across the Orange footprint from Q2 2011. Orange will showcase both these innovations at Mobile World Congress 2011. Visit the Orange Mobile World Congress stand at CY07. 0 comments on "Orange Gestures and 'smart' Live Wallpapers for its Android smartphonesannounced"